First, let’s get the terminology straight. When a beverage is brewed by adding steaming hot water to assorted plants other than true tea (Camellia sinensis), it is technically a tisane. Herb teas or tisanes can be sipped for enjoyment, used medicinally, or created to be part of a menu. In comparison, thirst-quenching infused waters are brewed and consumed cold; you might think of them as the herbal counterpart to cold-brewed coffee. Many infused water recipes include both herbs and fruit, so they make water more colorful and nutritious, too. Frozen berries enrich infused waters with color, with raspberries producing light pink water compared to the smoky purple from blackberries. You won’t need but a few frozen strawberries, blueberries, currants, cranberries or bramble fruits to impart punchy flavor to infused waters. Berries that are too tart to eat straight up work especially well in flavored waters, where their acidic compounds dilute into delightful aromatics. Now you get to start sipping. Expect flavors that are big and round and linger on the tongue. 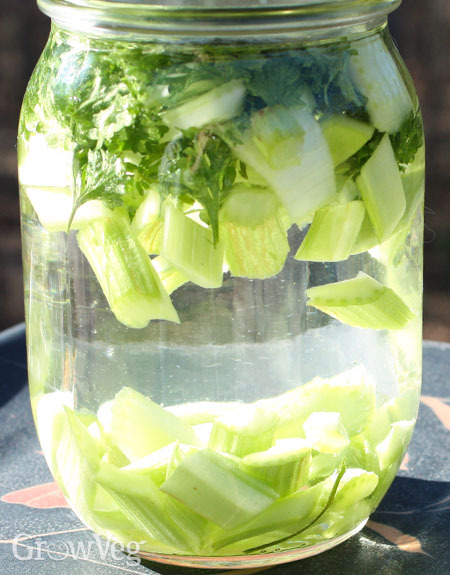 Most infused waters give off a light fragrance, too, which is part of the fun of making and drinking them. Get creative, try different combinations, and drink to your health.